We’ve been hearing about the “paperless office” for ages. With electronic invoice processing from EASY SOFTWARE, you are counting on the right solution at the right time. Gains in efficiency and transparency through Accounts Payable Automation are waiting for you – in the digital invoice receipt process. Get started now. Digital invoice processing means lean processes; always have an eye on deadlines for prospective discounts and possible notice periods. The current state of Accounts Payable Automation and how to digitise. This whitepaper presents recommendations for Finance, Accounts Payable and Procure-To-Pay practitioners to move forward, featuring research and insights from The Accounts Payable Association, AIIM and EASY SOFTWARE. No matter if the incoming bill is paper-based or arrives by email as a PDF attachment: EASY Accounts Payable Automation independently checks the conformity of every invoice with the GDPR. All necessary invoice contents are determined automatically: invoice header with creditor, total amount, invoice date, and all individual invoice line items. The verification and approval of incoming bills during Accounts Payable Automation can be standardized and nevertheless highly flexible to the requirements of the companies Accounts Payable as well as the ERP/Fibu system being used. The incoming invoice processing software has a variety of options and function modules available for this. Automatic assignment, efficient verification, and fast approval is the goal. Specific functional roles in the departments with various authorizations are defined in the same way as proxy roles for absence due to vacation or illness – thanks to Accounts Payable Automation. The process for posting follows successful verification and approval in digital invoice processing. EASY automatically transmits the necessary data for this to the linked ERP system. Since the process has already positively gone through the defined verification process at this point, the posting and payment of the approved invoice in the ERP/Fibu system can typically take place without further user action. Cross-department process monitoring creates transparence for the ongoing processes in the electronic incoming invoice processing and helps to spot potential disruptions or delays early. Escalation management ensures that occurring problems are solved automatically in accordance with defined parameters. The process monitoring of the Accounts Payable Automation supports not only the monitoring of ongoing processers, but also facilitates the retroactive retrieval and analysis of information on the course of closed processes. EASY Invoice presents the user with the personal, role-dependent dashboard as a starting page. This provides a quick overview of all relevant content. Employees of Accounts Payable can freely configure the dashboard with a variety of predefined gadgets. That way, every user of the invoice processing sees exactly the information which is relevant to them in their daily work. Among other things, the information includes tasks, deadlines, new or last used objects, favorites, and also information on key figures for the department or the company. All of these key figures can be displayed in graphical analyses. Compared to traditional, paper-based incoming invoices, electronic incoming invoice processing in business use offers only advantages. You will be surprised – once you have switched to Accounts Payable Automation you’ll never miss the old method. Let’s get digital. Digitise the incoming invoice processing with the following effect: In the course of the implementation, the process will be cleanly structured. All digital information from the AP Automation can be viewed at any time by authorized people in the department. That way, you always have an eye on the history and the further pathway of the incoming invoice. Reduction of the processing time for incoming bills to a minimum thanks to the Accounts Payable Automation. Up to the fully automatic posting of bills is possible. EASY AP Automation uses rule sets in order to establish approval processes for the digitization of bills. From the four-eyes principle for approval processes above a specific amount to automated notifications. As a result, you reduce time-consuming verification and approval processes to the absolutely necessary with Accounts Payable Automation software. Thanks to the practical full text search in EASY Invoice, you can always find bills with a mouse-click. That way, you avoid the familiar problem of misfiled invoices. 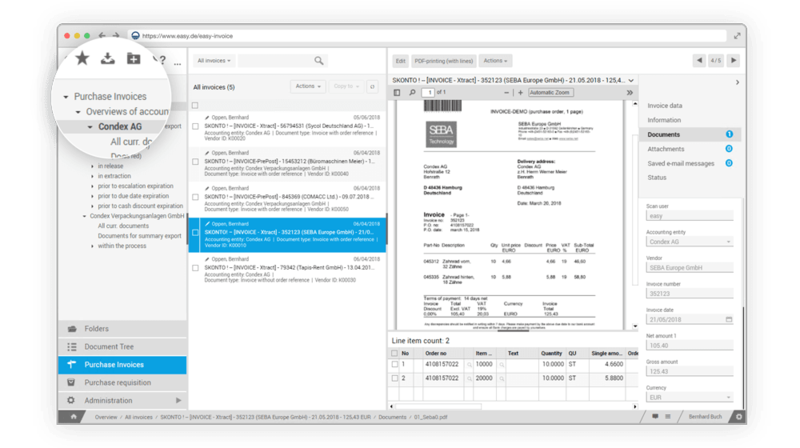 Avoid the widespread problem of multiple records of invoices. 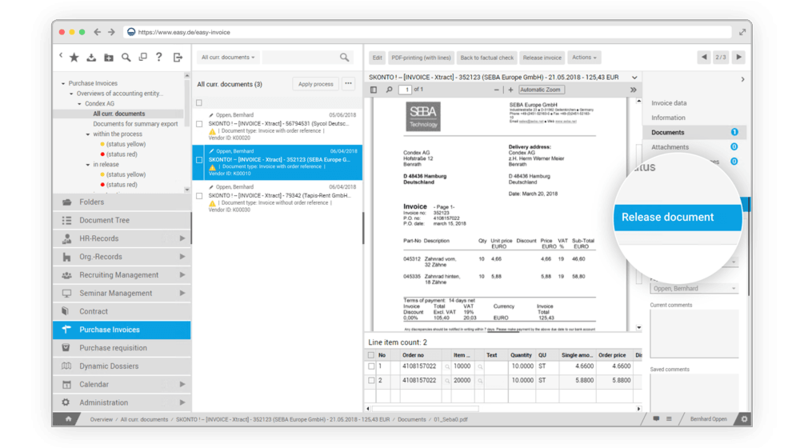 The EASY Invoice solution for electronic incoming invoice processing supports you in comparing the invoice’s header data with the data from the connected ERP and Fibu systems. Learn more about how automated invoice processing works, find out about advantages, legal requirements, future-proof invoice formats and how you can avoid stumbling blocks with digital invoice processing for Accounts Payable. The Premier League has a long term ambition of an electronic document future where each department over time converts to storing and retrieving its documents electronically and archiving off-site documents for long term retention. Over the last decade, the Council has been a pioneer in electronic invoice management, a strategy which will now serve the organisation well. Questions about automated invoice processing? We have the answers. 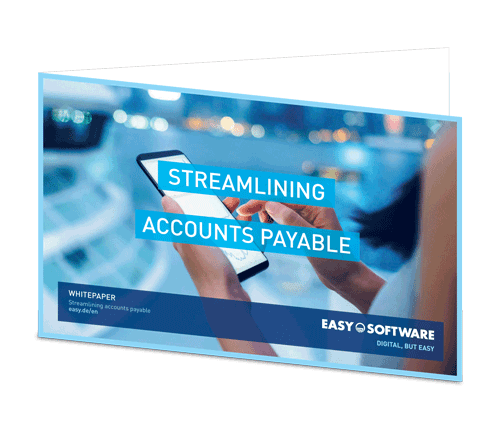 How will the EASY solution help me reduce costs at Accounts Payable? You will achieve a significant reduction in costs compared to paper-based invoice processing thanks to a digitised verification and approval process. All involved people can learn from the digital workflow what the status of an invoice is, in whose “virtual” hands it currently is, and who initiates the next step for approval. Manual searches, sorting & stamping are things of the past. Why will I not miss any more discount periods with Accounts Payable Automation? As is well known, the options for using discounts are date-linked. The digital process helps to meet the corresponding discount periods – automatically and with notifications for the corresponding functional roles. That pays off. Can I avoid dunning costs in the future? Thanks to the EASY solution for Accounts Payable, you will never miss another reminder period. It automatically notifies the designated specialist what must be paid when. What invoice formats does EASY Invoice support? well XRechnung: a comprehensive format for electronic invoices which can be used for the exchange of invoices between companies, government offices, and consumers. ZUGFeRD is developed by the Forum elektronische Rechnung Deutschland (FeRD; Forum for Electronic Invoice Germany). XRechnung is a Core Invoice User Specification (CIUS) of the European Norm (EN) 16931 on e-invoicing. With which third-party systems has integration already been achieved? EASY AP Automation has already been successfully integrated in a variety of backend systems in numerous projects. That includes the following systems, among others: Microsoft Dynamics NAV (Navision), Sage, Diamant, FOSS, Datev, Oracle Financials, Infor, Infor AS, SAP® and many more. Please contact us if you are looking for a specific interface with your system. How does EASY AP Automation help me to maintain an overview? 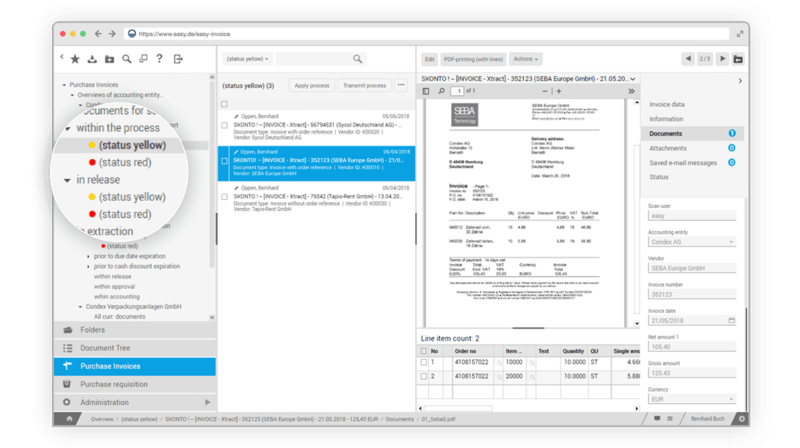 The EASY e-invoice system increases transparency incredibly – the incoming invoice book shows a summary of all incoming invoices and where in the workflow the invoice currently is, regardless of the format and the location where the invoice reached the company. Can I obtain an overview of the history of an e-invoice which has been in the company for a long time? Every incoming bill received has a history. This is not paper-based or presentable only with significant effort. Rather, the EASY system for Accounts Payable Automation has the option for process history management. This serves for the fast querying of the status of a received invoice at a given time. How legally compliant is the digital incoming invoice processing? Legal compliance is always a priority for a company. The EASY Invoice solution has the prerequisites to achieve legal compliance. EASY Invoice reproduces the following legal requirements: HGB §§ 238, 235, 257, 261; AO §§ 90, 145, 146, 147, 148; UStG §§ 14, 14b, 27, 27b and of course the GoBD (German Principles of Orderly Accounting and Storage of Accounts, Drawings and Documents in Electronic Form and for Data Access). Can the system also reproduce proxy rules? Employees get sick or take vacations – therefore the software must be able to manage proxy rules. The EASY Invoice solution achieves this with proxy roles which are defined once; you only have to tell the system which people should take on the proxy function. Does EASY Invoice also include a roles and rights concept? 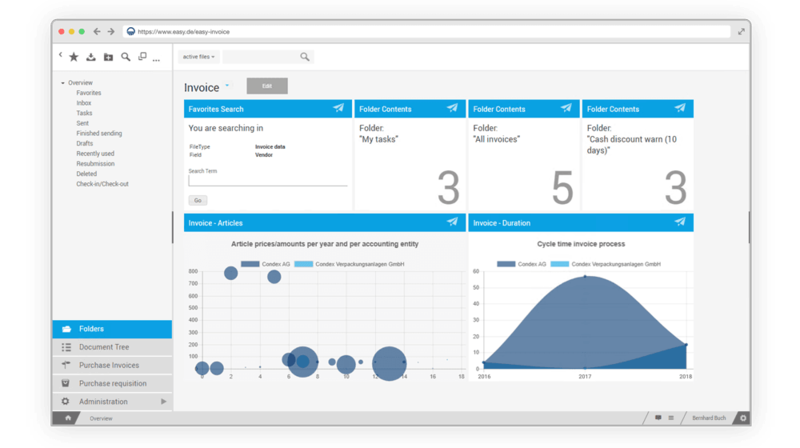 Fundamentally, the EASY software for e-invoice processing also has fine-grained role and rights management – important, among other reasons, for data protection and other compliance requirements. Not everyone should be able to see everything and certainly not process it. What characteristics should an incoming e-invoice solution have from the user’s viewpoint? Everything starts with a self-explanatory, intuitive user introduction. This was and is a leading concept of the EASY SOFTWARE design principle. It is obvious that if that is not provided and the software requires an introduction with a steep learning curve, working with it is no fun. Can I also use the EASY AP Automation System on a mobile device, such as a smartphone? Yes, the system also allows the use of mobile devices. Therefore, the system also handles mobile invoice approval. As a result, you remain location independent, and employees can work according to their role no matter where they are. As a web-based system, is EASY Invoice secure? Of course, EASY Invoice supports HTTPS and VPN protocols. Does EASY Invoice offer “overviews” and “reporting functions”? Of course, the Easy incoming e-invoice software has a dashboard: the accounting employee always has important key figures available; this simplifies reporting considerably. Does EASY Invoice support other applications? 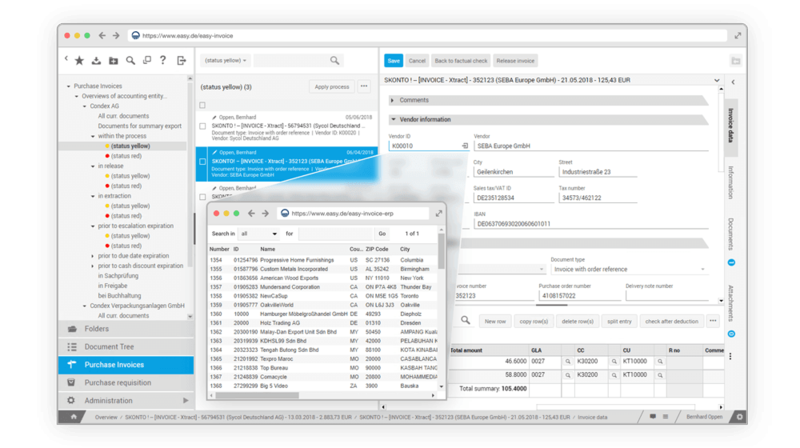 Of course, EASY Invoice also supports contract management, EBANF, etc. from the subprocesses of the procurement-to-payment process. Is there a training concept for EASY e-invoicing Software? Because of the intuitive operation of the EASY e-invoice software, users generally need about 30 minutes of training to be able to use the EASY solution. Furthermore, EASY SOFTWARE offers standard training on the subject of EASY AP Automation. In the course of 2 days, the training covers all relevant topics, such as installation, administration, workflow, extraction, etc. You can learn more about this from EASY Academy. Financial advantages await – see for yourself. Use our ROI calculator for a quick initial estimate of what financial advantages will emerge from our incoming invoice solution. It’s worth it!